← Microsoft Launches Windows Phone 7 Tomorrow– And We’ll Be There Live! As was promised, we finally today got to see what Windows Phone 7 looks and feels like. After spending a good deal of time with it today, color us very impressed. Not only has Microsoft fought back in the smartphone “battle,” but a lot of what they showed off looks like it will give Apple, RIM, Palm and Google a very strong run for your money. Here’s the full breakdown of you’re gonna want to know. Messaging and Typing—One of the key parts of any phone today is how well they can text message. For many of us, it’s pretty much the only core feature we want or need. 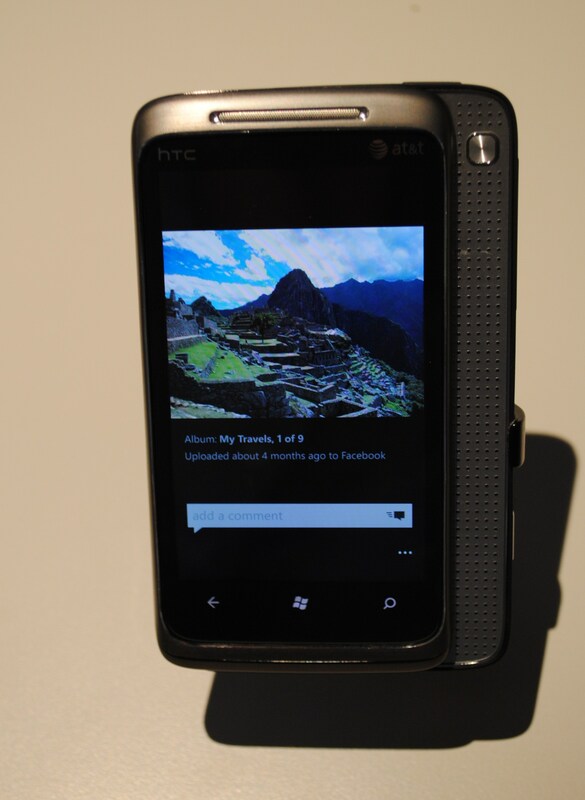 Windows Phone 7 looks to do this very well. It’s messaging app is pretty much like those on any other iPhone or BlackBerry, offering threaded (or IM-like) conversations (where all your texts to that particular group or person is in one location), and what I think is an excellent keyboard. 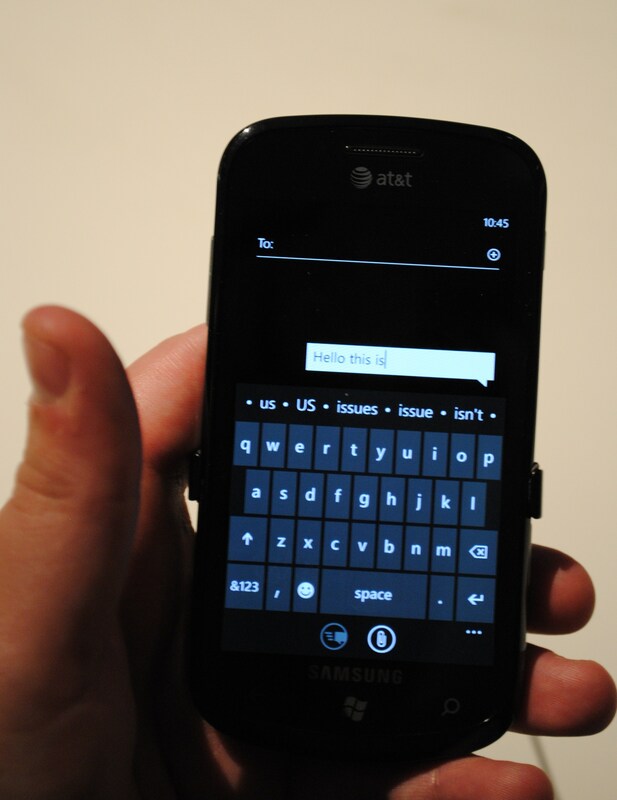 I was able to easily type on the on-screen keyboard, even while trying to juggle taking photos in my other hand AND never seeing a Windows Phone 7 device in person before. It’s that good. You just pick it up and it feels great. Photos and videos—Photos and videos on the phone run incredibly smooth, and on phones with high-res screens like the AT&T Samsung Focus, they look great. 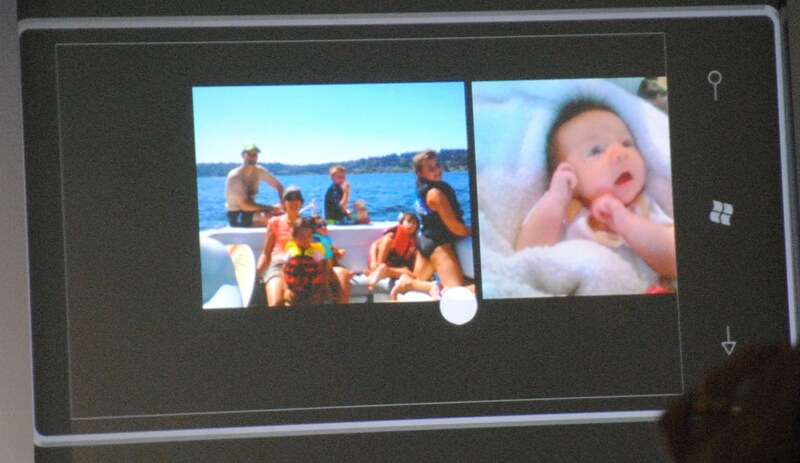 All Windows Phone 7 screens are multi-touch so pinch to zoom is there, and if you pinch out while in the photos app, your presented with a “film strip” like gallery of your photos (seen above). Social Connections— What I mean here is that you’ll have full access to your social networks right out of the box. In fact, social networks like Facebook and Windows Live are key parts to the OS. Contacts (or as Microsoft refers to it– the “People” hub)? Log in once and they’re all synced from your social network of choice. Photos? It pulls in all the photos right off your and your friends FB accounts. Commenting and status updates? You bet, and you can even comment on someone else’s photos and statuses. The only thing missing from the FB experience seems to be the ability to play videos from your friends Walls, and even that will be fixed with a separate, official Facebook app. If you’re a Facebook addict, then you should definitely check this out. Zune—Like the ill-fated KIN before it, Windows Phone 7 devices all ship with Zune built-in. This is the full Zune experience– music, FM radio, Zune Pass (where you get unlimited streaming of music and the ability to download 10 songs each month for only $15 a month), videos, and the Zune Marketplace—all are here and run just as they should. If you have a Zune Pass, you can search and stream songs over 3G right to your phone (you can’t though yet buy movies or TV shows over 3G, you’ll still need a PC for that). Speaking of a PC, you can also wirelessly sync your phone right over your home WiFi network. This means no more having to find that pesky cord when trying to change a few playlists or songs (again, this also for the time being is music only, no video). Xbox Live—This is probably the most exciting thing we saw today, and for those looking for a great mobile gaming experience, Windows Phone 7 looks to deliver. Not only can you do “simple” things like customize your Avatar, but you can also play Xbox Live Arcade games with your friends online (like what Apple’s Game Center is trying to do for the iPhone). Oh, and the graphics potential on this thing looks amazing. 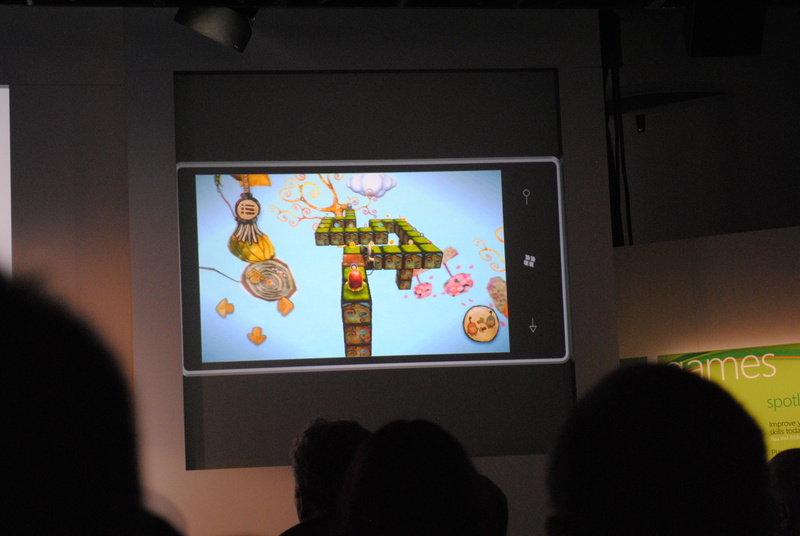 A casual game called Ilo and Milo was shown off (it’s like a puzzle game where you got to tilt the phone to navigate and got the characters to meet. See the pic above), and the 3D graphics on THAT we’re insane. As developers take more advantage of the power on Windows Phones, I can definitely see this being an even better gaming experience than an iPhone/PSP/DS when it comes to portable gaming (and I really can’t wait to see what EA, who has said they will have games ready in time for the November 8th Windows Phone 7 launch, has conjured up). Overall: Windows Phone 7 on an OS level looks great. Using the OS was fast, smooth and extremely responsive no matter what was going on (and on any of the phones I used it on I don’t think I saw it lag once!). Throw in the high bar that Microsoft has set for the minimum specs (1 GHZ Snapdragon, 5 megapixel camera to name a few), and added features like a free GPS locator in the event you lost your phone (say if you lost your phone on a bus, you can go back to your computer, log in to your Windows Live account and be able to get the exact GPS location of your device. And unlike the iPhone’s similar MobileMe feature, this doesn’t cost you $99 a year and is free for all Windows Phone 7 users– though unlike the iPhone you can’t lock or delete your phone remotely yet), and this is very much a great experience I can see on any and all Windows Phones. But if you’re looking for a new phone is this better than an iOS, Android or BlackBerry phone? For that I’m not yet sure as I’ve only seen the OS for a little bit and a lot still is up to how developers embrace the platform, but from what I did see, if you go with Windows Phone 7 it definitely doesn’t look like you’ll be disappointed. Posted on October 11, 2010, in Cell Phones, Microsoft and tagged att, first look, Microsoft, microsoft open house, windows phone, windows phone 7. Bookmark the permalink. Leave a comment.